Welcome to my first week of Third Week Throwbacks! I mentioned a bit ago I was going to start this new feature on my blog. The third week of every month I'll be doing a week (3 posts) of throwback nail polishes! These polishes will be 2 or more years old. Hopefully these posts will get you to shop your stazh more and reignite some love for older polishes. The Zoya polish I have to share with you today I'm really not sure about. I had this polish a few years ago, and I swapped it away. I don't remember why I swapped it, but I ended up missing it. During a recent Zoya sale, I repurchased it, but it's not how I remembered it at all. I honestly think they changed this polish! Meadow is a frosty, golden peach with a copper flash. This is my swatch of my older bottle from 2010. Please excuse the horrible swatch, this was when I just started blogging. Color: This is not the same Meadow from a few years ago. Zoya must of altered the color. What I liked and missed about the old meadow was that is was definitely a neutral toned medium pink with a soft golden-peach shimmer. The new Meadow is straight up peach with an intense frosty peach/gold shimmer. This went from being a very wearable neutral color to straight up grandma color. 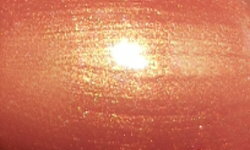 Formula: The formula application wise was fine, but the shimmer in it now is very frosty, so it's brushstrokes galore. Overall: This is a massive WTF? polish moment for me. I don't have confirmation from Zoya this was reformulated or changed, but it must have been. If you Google this color and look at images pre-2012 you'll see I'm right. The swatches look like my older swatch color. If you have the old Meadow keep it and cherish it. Don't bother with this new fugly Meadow. Wow! This is seriously different than my original release bottle. There is no question they changed it. I know someone else brought up one of the Pixies being a different color as time went on, too. This kind of batch variation/reformulation is really not acceptable. I mean, Zoya has released totally different shades that are closer to being dupes than this. They should have just renamed it. Not a color I would wear much. That's a bummer since I really do like peach color. Wow. That's quite a difference! I did notice that a couple of older Zoyas look differently in swatches from the bottle shots on their site. Wow those aren't even close to being the same! It's a shame, the original is so pretty! I wish they would have. I guess the figured the original was so old no one would notice? I did! I know. I'm really bummed out about it. I don't hate the new Meadow-- if it wasn't brushstrokey and frosty it would less grandma and very pretty (maybe). Truly, though, the old Meadow is gorgeous and I hope you can find it again some day! Bummer that Zpya completely changed it.